An untitled painting by William Sanger. Margaret Sanger and her family members are best known as birth-control pioneers. Yet three of them were also artists. Now their watercolors are on display at the Planned Parenthood of Northern New England’s gallery in Portland, Me. The work includes pieces by Sanger, the founder of Planned Parenthood Federation of America, who took up painting after moving to Tucson in the late 1930s for her health, making mostly desert scenes. 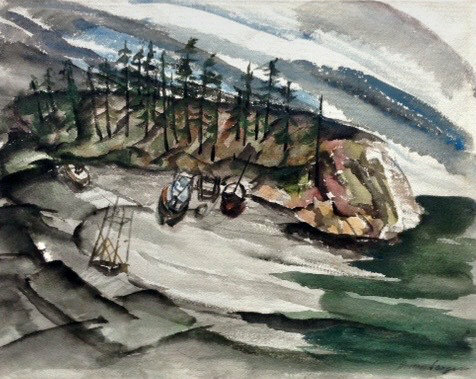 Her husband, William Sanger, was a painter and an architect, who began displaying his work in the 1910s; much of it featured stormy landscapes of Maine, where he was a frequent visitor. Their grandson Alexander took up drawing and watercolors after his retirement as president and chief executive of New York City’s Planned Parenthood in 2000. He, too, paints on the Maine coast as well as in New York, where he is chairman of the International Planned Parenthood Council. Source: NY Times, Friday May 22, 2015.